Happy Sunday! I hope you all had a wonderful weekend. The boys are on the cusp of getting colds so we have spend a lot of time inside just playing and keeping warm. I made this card with the thought of making it for a baby girl but it didn't turn out that way. I have lots of left over paper from my invitations so I thought I would use them. Check out my cute little sentiment tag, I used the Big Shot to make it. :) Enjoy and thanks for stopping by. Sarah - I love this. 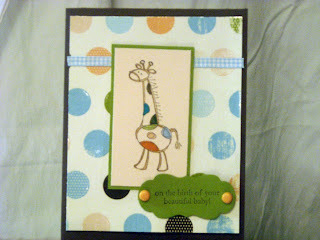 The giraffe is too cute and it's perfect for a baby card. Hope the boys feel better soon. Sarah this is just sooo sweet, love the giraffe. Love your card. You will have hours of fun with your big shot!! I love mine. That's a really cute card! I love the different color spots! A very cute card - love the spots on the giraffe and that matching spotty paper!! wow this is so fun! LOVE IT! I like this and think I might use it for some inspiration on a baby girl card I am making. Very cute and congrats on your big shot. 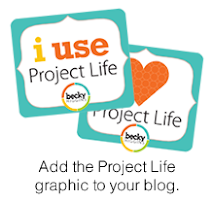 Making die cuts is so much fun, so I'm sure your big shot will be a big hit for you.